At Agilite, our goal is to create dog agility training equipment that is lightweight, compactable, effortless to transport and carry, easy to set up and take down, easy to adjust, durable, safe, versatile, affordable and fun. Rowdy, the Papillon, loves to jump. Frannie, his loving owner, took him to dog agility training. One class a week just wasn’t enough for Rowdy. Frannie tried to find some agility equipment for home training, but was unimpressed by the heavy, awkward equipment available. A manufacturer of 25 years in the outdoor business, she knew that better equipment could be made. With a little help, she designed and built the first hurdle. Agilite was born. Then came a tire jump, chutes, tunnels, and weave poles. All light, compact, and easy to use so a complete course sets up in minutes and tucks away in a closet or car trunk. Agililite is versatile enough for living room training or complete course practice outdoors. Rowdy gets to jump all he wants now. So can your dog. “And they all lived…” well, you know. 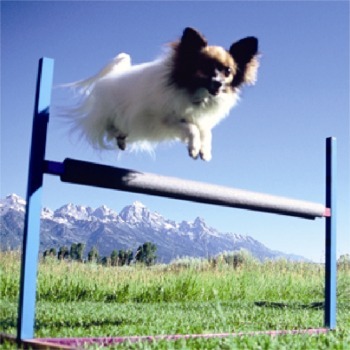 Agility originated as an activity back in 1978 at the Crufts Dog Show, England’s largest dog show. The organizers recognized that looking at an empty show ring was boring and arranged for a demonstration of what is now known as agility between the end of the obedience championships and the beginning of the group judging. It was such a big hit, show organizers decided to make it part of the competition the following year, and the world’s first agility contest was organized. Even though agility began in the late ‘70’s, obstacle design and materials are still in their infancy. People who are designing equipment in their garages are leading the charge for creative solutions to building see-saws, jumps, and dog walks, etc. and oftentimes sell them at local trials. Many agility clubs have “equipment days” where they construct obstacles and trade or sell them to other club members. And now there is the establishment of a handful of companies that are manufacturing and selling agility obstacles. At Agilite, we set out to make agility fun. We think designs that are both functional and aesthetic are important. Durable, but light -- easy to set up and take down, and simple seem to be objectives that are mutually exclusive, but they are achievable. These design challenges are what drive us at Agilite. We recognize that some people live in the city, travel on weekends or take a trip to a vacation destination. 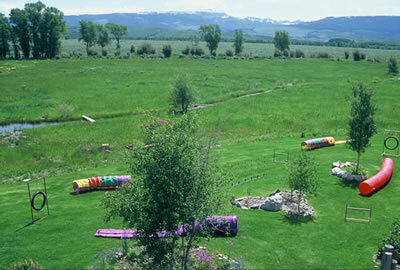 We also know that some agility participants don’t want their yards to look like an industrial plumbing supply store. For these people we looked at the construction of agility equipment through a new set of eyes and materials. 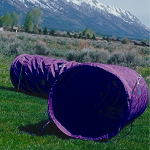 The advantages of PVC are indisputable and it has a long history of being used in agility obstacles. It has been mass-produced since the 1930’s and is readily available, inexpensive, and is simple and easy to work with providing design flexibility. The shortcomings of PVC, however, are as real as its virtues. It is rigid and somewhat brittle. It has a low ultra-violet (UV) resistance and after just a few months in the sun, we noticed that equipment would yellow, break down, and even crack and shatter due to the degradation from the suns ultra-violet rays. Being a thermoplastic, PVC is susceptible to collecting dirt, sand and grit that would immobilize and lock joints so that equipment could no longer be broken down for transport and storage. 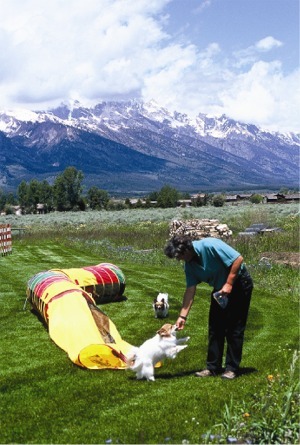 Put your creative juices to work and you can buy open tunnels and collapsed tunnels (chutes) in a variety of places: from a club, at an agility trial, mail order, and Ebay and other on-line sources. Many of these products are manufactured from industrial strength materials making them very heavy and bulky, and require the use of holders, sometimes called “leashes” to pack and to carry. At Agilite, we’ve selected the use of polyester textiles in the fabrication of our tunnels and chute. Polyester has numerous advantages over nylon fabrics. First, it is more abrasion resistant and offers higher tear strength than nylon fabrics of similar weights, allowing for the combination of lightweight products that are still strong and durable. Secondly, polyester is hydrophobic, meaning it doesn’t absorb water. Nylon possesses hydrophilic qualities, that is, it absorbs water and as a result can be vulnerable to decay. Modern coatings have reduced this susceptibility, but how many tunnels and chutes are made using coated nylon? Finally, and equally important, polyester fibers are much more resistant than nylons to degradation from the suns harmful Ultra-Violet (UV) rays, eliminating the need for a tunnel cover to keep the color of your tunnel looking fresh. This is also valuable for those living in the country’s Sunbelt, which allows you to leave your tunnels and chutes set-up outdoors for extended periods of time. We conserve weight on our tunnels through the combination of a longer, 11” pitch, or spacing of the tunnel rings, and use of fabric slots sewn into each side of our tunnels for stakes (our 18’ tunnel has 14 stake slots, 7 on each side) that securely holds the tunnel to create “J”, “C”, and “S” shapes without excessive fabric sag.